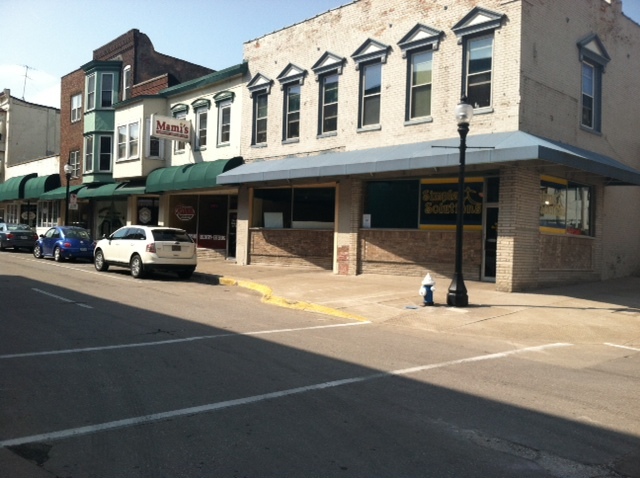 MUSCATINE, Iowa — Roughly a decade ago, Tom and Ann Meeker and a group of Muscatine investors opened Pearl Plaza, a connected network of eight renovated historic buildings in the 200 block of West Second Street. The complex — with its brick archways, wrought-iron gates and an atrium with a glass elevator — has been a bright light in downtown Muscatine. It is home to six businesses, at least a couple of offices and apartments and condominiums on its upper floors. Some developers might have stopped there. But not the Meekers. They have moved their energy and resources across the street in the 200 block of West Second to buildings they have owned for the better part of a decade. And their patience is paying off. This month, Doc Cindy’s Doll Hospital & Shop opened at 207 W. Second St. and Simple Solutions opened at 201 W. Second St. Their openings have all but filled the entire block of storefronts on both sides of the street. It is quite a sight and a real accomplishment. 201 W. Second St. Simple Solutions. Muscatine Downtown Investors/Tom and Ann Meeker. — 205 W. Second St. Mami’s. Muscatine Downtown Investors. — 207 W. Second St. Doc Cindy’s Doll Hospital & Shop. Muscatine Downtown Investors. — 209 W. Second St. Grandma’s Lost Button. Muscatine Downtown Investors. — 211 and 215 W. Second St. Feather Your Nest Interiors. Muscatine Downtown Investors. — 208 W. Second St. Pearl Plaza (multiple businesses). Muscatine Downtown Investors. — 218 W. Second St. Hill’s Paint Store. Brent W. Hill and Torina Hill. — 222 W. Second St. Pearl City Iowa Realty. Muscatine Downtown Investors. — 224 W. Second St. Moody Heating & Air Conditioning Inc. Muscatine Downtown Investors. Ask too many Muscatine residents and they will tell you there is nothing to do downtown. And, it’s true, many businesses have come and gone in recent years. But something remarkable is happening on the far west end of Muscatine’s downtown. Thanks, largely to the Meekers, similar good things are happening elsewhere in downtown Muscatine, where there is a relatively new chiropractic clinic, a new boxing gym and at least two new restaurants preparing to open. About 30 members of the Downtown Action Alliance met Monday evening at the Port City Underground, according to the Muscatine Journal, to brainstorm ways to strengthen their organization and the downtown businesses that comprise the alliance. What’s happening in the 200 block of West Second Street is a good start for the rest of downtown Muscatine. It would be nice to see others with the resources step forward and make a similar investment. But everyone in Muscatine ought to be thankful for what it happening in this part of their community and we all ought to do what we can to support these businesses. In full agreement about downtown, Chris. It is a beautiful hisoric area and with continued energy like there evidently was last night, it could really see a turnaround. I am all for the historic facade idea. returning some of the storefronts to their original glory would be fantastic! Congratulations, BTW, Michael. If I’m not mistaken, when I was out driving around over the weekend, I saw a “sold” sign in the yard of the second house you restored. Muscatine’s downtown has amazing potential. What it has lacked to this point is a strong coordinated effort and leadership group with purpose and vision. Wrangling entrepreneurial, small business-owners to rally around a common cause is a challenge in every community, even when it’s obvious that the cause is good for all of them. Here’s hoping the DAA can gain some momentum from this meeting and become that rallying point. They might be a good story also. They both have jobs, but they want to open a bed and breakfast there this summer. They are REALLY nice people from colorado. Great to have in the neighborhood. Thanks, Michael. I’d like to visit with them if you want to email me their names and a phone number or email address. Hope it works out for them. I’ve always been under impression that zoning restrictons — especially related to off-street parking — would make it very difficult for someone to open a bed and breakfast in Muscatine. Wow..I, too am delighted that your beautifully-restored house has sold! Chris, if you do a story, I hope you include a “before” picture, because it’s one of the best makeovers I’ve seen. And I agree about the downtown revitalization. As a downtown resident, I love that my bank, library, church, favorite restaurants and fun shops are all in walking distance! Chris – thank you so much for your kind words. Tom and I are very passionate about Muscatine and the downtown in particular. We’ve been fortunate to have wonderful partners for our large projects, such as Pearl Plaza, the hotel (Pearlview Condominiums) and our current project on Mulberry Avenue. The best reward we get is comments from people telling how much they enjoy and appreciate what we are doing. That makes all of it worthwhile. Our belief is there is no reason why Muscatine can’t be the best, shining example of riverfront living at its best. You’re welcome, Ann. Muscatine would be better off if it had 100 couples like you and Tom, so it’s very lucky to have you. Please tell Tom I was sorry to hear about his dad.